Connecting the Jacob Henry Mansion to the Old Central Church is a winding path of brick pavers that passes through the Estate’s pristine lawn and gardens. The simplicity of this natural backdrop highlights the beauty of your wedding party as you pose among colorful flowers and lush greenery. 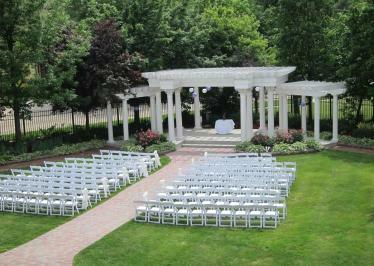 Al Fresco ceremonies and receptions are perfect for couples wishing to embrace the inherent beauty of their wedding day. A trellis, decorate with flowers, stands centennial to your ceremony, and an outdoor tented ballroom is installed within the lawn’s expanse to accommodate up to 300 guests.